From Western Maryland’s Deep Creek Lake to the Chesapeake Bay, and with rivers and lakes in between, there are ample opportunities to get on—or in—the water in Maryland. Here are some highlights from around the state. If you are looking to zip around the water on a powerboat, water-ski or go tubing, head to Deep Creek Lake. You can also rent a pontoon boat, kayak, or paddleboard and just cruise around and relax with friends. Perhaps you’d rather try your hand at Maryland’s iconic sport of sailing? In Baltimore, Getaway Sailing offers instruction, certification and sailing club memberships. It also offers relaxing day cruises and a three-hour “trial” sail where you can try to sail on your own. Havre de Grace’s BaySail on the Chesapeake also has instruction as well as charter opportunities, as does the Annapolis Sailing School—the nation’s first sailing school founded in 1959—which offers private instruction, beginner, intermediate and advanced courses, and sailboat rentals. History buffs can even take a sail in St. Michaels on the skipjack H.M. Krentz, a Maryland skipjack, the traditional Chesapeake oyster dredging vessel and the official Maryland state boat. The Jug Bay Natural Area of the Patuxent River Park is a great launching point, and the park offers guided trips by park naturalists, as well as daily and hourly canoe and kayak rentals. The tidal freshwater wetlands here offer a great opportunity to get close to nature. In Baltimore County, try paddling the Gunpowder River. 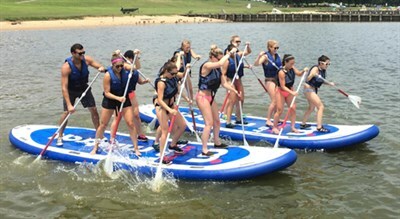 Head to the Hammerman area of Gunpowder Falls State Park where Ultimate Watersports conducts wildlife and sunset tours, and also gives lessons and provides rentals. 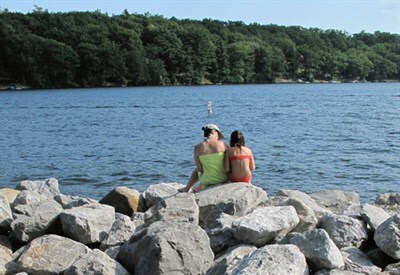 The park has a swimming beach, picnic pavilions, fishing, and hiking trails—perfect for a family day of fun. In Charles County, the Mattawoman Creek is a wide estuary that flows into the Potomac River near Washington, D.C. Up the Creek Rentals has kayak rentals and lessons from its location in Indian Head and you can put in at its facility. Caroline County has more than 80 miles of waterways for paddling on either the Choptank or Tuckahoe Rivers with five public access points. Also, Rock Hall is on a pristine stretch of the northern Chesapeake Bay, and Chester River Kayak Adventures offers full- and half-day guided tours, as well as sunset and moonlight tours. All the tours are focused on the environment and the various birds and animals in the area. For the more experienced paddlers, you can also rent kayaks and paddle away on your own. For seasoned fishermen, there's no prize bigger than marlin, and if you're looking to bag some billfish, Ocean City, the White Marlin Capital of the World, is where you want to be. Legendary fighters, white marlin are plentiful off shore and over the canyons, but anglers will also find majestic blue marlin weighing half a ton, tuna and other great game fish. Looking for something new? Try salt water fly-fishing for shark, bluefish, bonito, and more. Ocean City definitely offers the right charter for you. Marlin may rule the sea, but when it comes to the bay, the rock are king. Rockfish, also known as striped bass, are prized not only for their tenacious fight, they're also one of the tastiest fish around. Firm and succulent with a clean flavor reminiscent of tuna, there's nothing as satisfying or refreshing as a tangy rockfish ceviche and a frosty beer after a day out on the bay. Catch a charter in the upper bay out of Middle River in Baltimore or right out of the Annapolis dock. On the Eastern Shore, head to Kent Island or Rock Hall. For middle and lower bay, try Deale, Solomons, or Point Lookout. For more information check out the Maryland Fish and Hunt website.